Today, IDW Games announced the official release date for the first in a series of CHEW tabletop games. CHEW: Cases of the FDA will be available in May of 2015. This fast-paced, high-laughs card game features art by Rob Guillory, including a brand-new box cover, as well as text by CHEW creator and writer, John Layman. IDW Games tapped designer Kevin Wilson (Descent, X-Files, Arkham Horror) to create an appropriately over-the-top card game worthy of the CHEW name. Based on the Eisner Award-winning comic series, CHEW: Cases of the FDA card game seats 2-5 players and is playable in about 30 minutes. Players compete to close cases pulled directly from the pages of the ongoing comic book. They’ll enlist partners like John Colby, Amelia Minz, and even Buttercup the lion, while simultaneously sending fiendish villains and cultists out to sabotage their rivals’ investigations. As an added bonus, all pre-ordered copies of the game will include an exclusive variant edition of CHEW #1 featuring Guillory’s homage to Dogs Playing Poker packaging artwork, as well as 20 pink CHOG plastic minis that will change color in future printings. 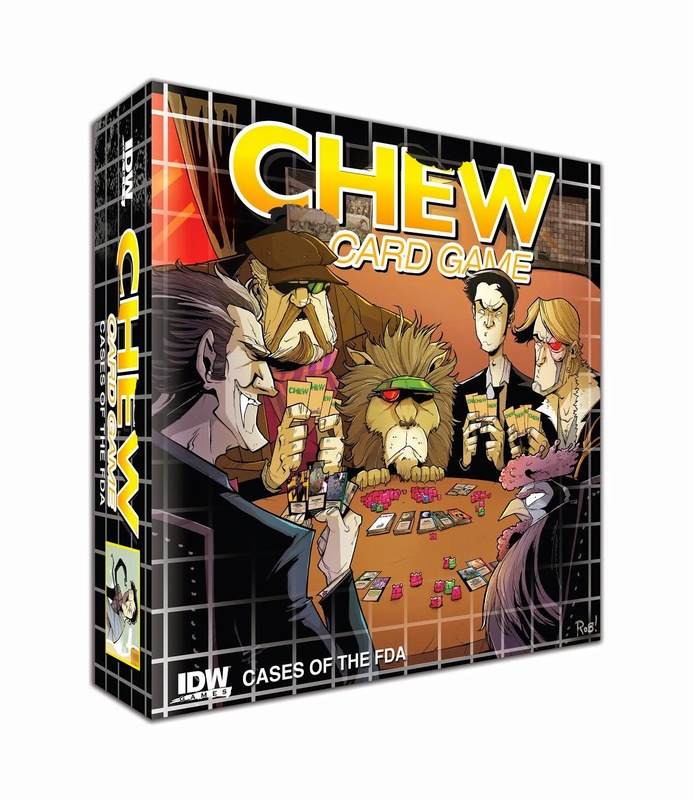 Head to your Friendly Local Game Store to pre-order CHEW: Cases of the FDA and while you wait for the game to finish baking to perfection, visit http://www.idwgames.com and “like” facebook.com/idwgames and follow @idwgames for more bite-sized teasers.